Recife is the capital of Pernambuco. A city of contrasts, skyscrapers and wide avenues contrasting with beautiful colonial buildings. Called the "Venice of Brazil" because it has several canals and bridges over rivers and Capiberibe Beberibe. Said to resemble Amsterdam, since in the 17th century the city was controlled by the Dutch. The part I like is closest to the harbor and rivers, with rows of Portuguese colonial buildings on the banks. What I thought was a very safe city, I visited on a Sunday morning, and the colonial part was practically deserted, with dozens of homeless people sleeping in the streets and cars whizzing through the streets with unsavory characters inside. 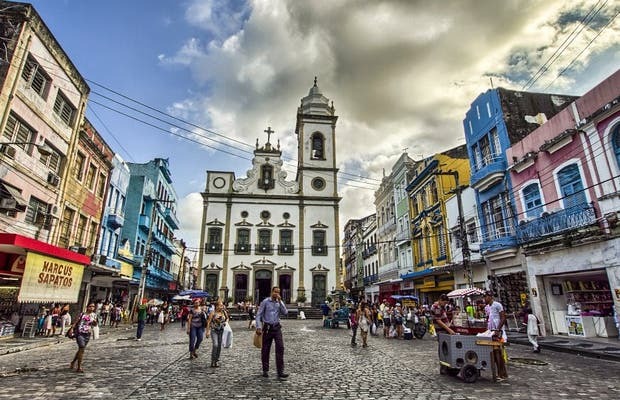 Life in Recife is colorful and an amazing contrast between the rich and the poor. This gentleman is in the heat trying to make a living.